Chamfron Rufina left us in March, she has gone to a lovely new home with Lisa Nicolls. Early April saw Chamfron Paloma heading South to Berkshire. 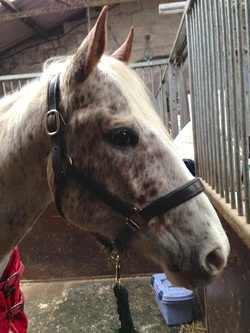 She has gone to a new home with Alison King and will be aimed at Horse Agility, Le Trec and Western. 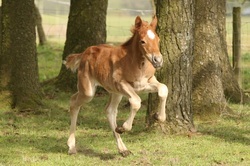 Our lovely polo mare Lady Erica foaled on Friday the 12th of April. 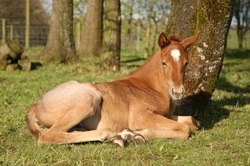 Despite being scanned with one foal she had twins, a chestnut roan colt sadly born dead and a tiny little bay roan filly. 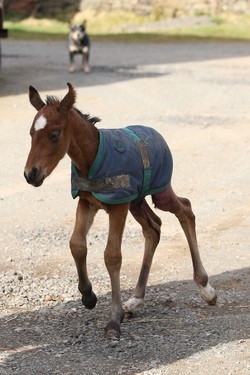 The filly struggled to stand and could not feed herself but after four days of bottle feeding she was up and on the udder. We hope she continues to go from strength to strength. Now named "Chamfron Perdita" she is pictured here in Silks's rug, Silks is a whippet! 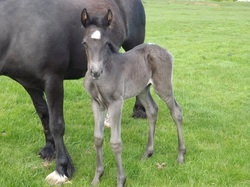 A filly foal for Kayreen Jones, by Exbury Ghost and out of the Dales mare Kilmannan Bluebell. 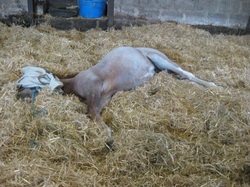 The ever polite Bluebell foaled down bang on her due date at a respectable hour. She has been named Garrabeg LilLakota Sioux. The very smart Wills, a two year old gelding by Exbury Ghost has been sold to Rory Nicoll and joins Chamfron Rufina owned by Rory's wife, Lisa. Wills will be broken to ride and drive and we really look forward to seeing him in harness. A rare showing outing for us! We had a great day out at the Scottish Grass Sickness show in the glorious sunshine on the 2nd of June. Our Criollo stallion Arrayan Numa won the foreign breeds class with Mark and the roan/palomino/spotted class ridden by Laura and then took Reserve Champion in ring three. He certainly attracted a lot of attention and made some new fans! We also caught up with Rebecca Crump who won the in hand roan/palomino/spotted class with the two year old Chamfron Firefly. Betty left us at the end of June to join Rowena Kennedy, she will be aimed at Eventing eventually but we hope to see her out at some shows in hand first. 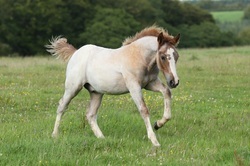 A super natured filly who was starting to colour out rapidly. 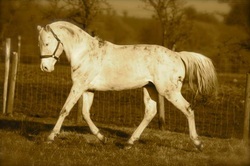 Sadly we made the decision to put down our Appaloosa stallion at the end of July due to a leg injury. 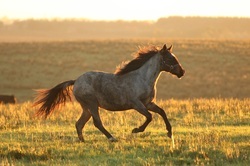 He was a lovely easy stallion who threw foals with super temperaments that really moved. 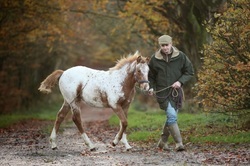 He leaves us a fantastic 2013 foal crop and both Carter Bar and Oor Eagle Eye Cherry scanned in foal to him for 2014. Deja Vu left us at the end of July for a new home in Yorkshire with Natalie. Her plans for the future include film and stunt work, going to be famous! 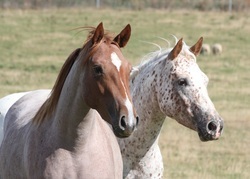 Tigger, Toledo, Morello, Lysander and Bombero all had their pockets picked at the end of September and are now geldings. 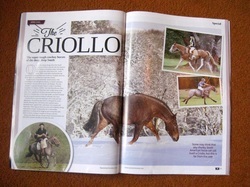 There is an article on Criollos in the September issue of WHUK, our stallion Arrayan Numa features in the article and it includes photos of Arrayan, our broodmare Fatima and her foal Chamfron Ojo de Tigre. 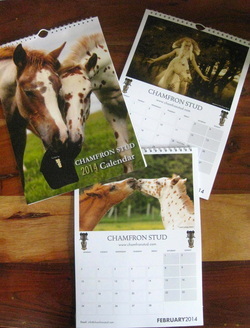 Our 2014 Calendars have now arrived and are available to purchase for £12.50 inclusive of postage (they are A4 in size) - please email me on laura@chamfronstud.com if you would like to order one. There is an embarrassed dog in a Santa hat for December...! Great to see so many of our youngsters out at a very busy breed show. Chamfron Firefly was Reserve Champion Female and Sakura, Colorado, Snow Goose and Britannia were placed in some large classes. Please see our Images - Youngsters Gallery for photos and full results. Tigger is the first of our 2013 foals to leave home, he has gone to join Lindsay Purves in Musselburgh and will be aimed at Le Trec in the future. The dark nights are a good time to update the website and there have been a few changes for Chamfron youngsters in 2013. 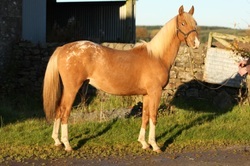 Chamfron Colorado is now owned by Lorna Forrest in Stranraer and will be aimed at an endurance career. 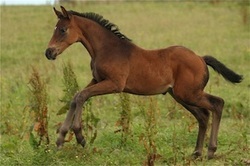 Crioch Kestrel (out of our broodmare Midnite Harmony) who we bought as a foal at foot and sold as a yearling is now owned by Tina Rogan in Kent and will be produced as a western horse. 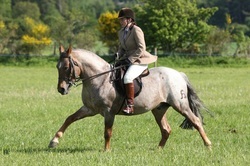 Chamfron Mimosa, Parador and Caramia have moved with the Scott family to Clonakilty in Ireland. The Scotts are enjoying having the horses at home and the beach just minutes away. Bellini has been sold to join Natalie Brougham on the Isle of Wight. 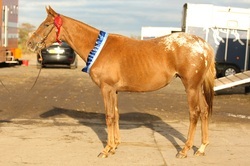 Natalie has been very successful in the show ring with an "uncle" to this filly (Exbury Firefly who's sire is Amazing Moonstruck, Bellini's grandsire) including ApHC Supreme Champion at the breed show this year. 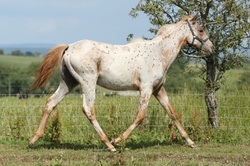 The yearling filly Yolanda has gone to Yorkshire to join Kirsten Pearce as a polo pony. 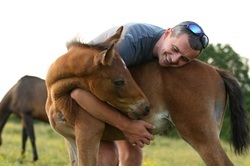 The super sweet filly foal Mara also left with Yolanda to become a polo pony with Kirsten. We were pleased to hear that Chip had arrived safely in Anglesey and is now owned by Linda Dykes who originally recommended us to her previous owner. Chip has been broken in western and will now be schooled English as well. I'm looking forward to seeing her out competing in 2014.